At Old Trafford [in 1955] I bowled a bouncer at Roy McLean, the South African. It cleared both him and Godfrey [Evans], bounced once and then hit the sightscreen. My career could have been so different had I played out of Lancashire rather than Northants. Harry Makepeace, the head coach, told me once that if I played for Lancashire, he would make me an England bowler. As it turned out, though, I was to play only once for Lancs, in their 2nd XI, and bowled five overs before breaking down. They never did ask me back. We never thought the series was lost even after being beaten by an innings in the 1954-55 Brisbane Test. We went back to our hotel, Lennons, and Len [Hutton] called for champagne all round. "Don't worry," he told us all, "we may have lost this Test match, but we're going to beat them. This is the first time I've ever been with an English side where we have the quicker bowlers." He was convinced our best was to come, and it was. My first taste of opposing international-class players was with Middleton in the Central Lancashire League. I was 16. There were quite a few internationals in the Leagues, people like George Tribe, Vijay Hazare and Charlie Barnett. Jock Livingston helped open the door for me at Northants. He was one of the chief recruiting officers, a good cricketer with an eye for who could play and who couldn't. That doesn't always happen now. Paid administrators don't always have the playing background to know just who is capable of making it and who isn't. Ask some of the Australians and they'll say my fastest spell was Sydney, 1954-55 - the match where I was sconed by Ray Lindwall. I was pretty cranky about what had happened and I did bowl fast. But I wouldn't say that it was the best I'd ever bowled. I had eight years of county cricket but took 100 wickets in a season only once [101 in 1957, including 86 in Championship matches]. 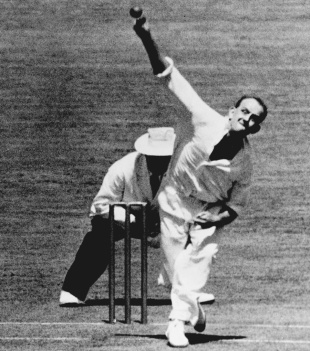 Len Hutton's best batting days may have been behind him in '54-'55 and he struggled with some mental demons too, but he was a very shrewd captain. As the tour progressed we'd bowl little more than 12 overs an hour as George [Brian Statham], Trevor Bailey and myself were rotated. It gave us maximum time to rest and recover in between spells. It slowed the run rate down tremendously. I remember chatting to Bill Johnston about it one day and he said how the cricket was dull because of the diminished over rate. "But, Bill," I said to him, "we got you out!" The toughest batsman to dismiss was Neil Harvey. You always knew that if you didn't get him out he'd soon hurt you on the scoreboard. People labelled him as a great player of spin, which he was, but he was also a very sound player against everyone else. I was probably at my quickest when I first came to Northants after a year playing for Knypersley. I was fresh from university and raring to go. Things still get me annoyed. The anomalies, like registration, for example. I went to the University of Durham and was classed as a professional, yet others like [Raman] Subba Row came along. He'd been to Cambridge and he played for Northants as an amateur. They found him a job as assistant secretary. They didn't find me a job. It was the system which was wrong. Warwickshire did the same thing with Mike Smith. It was just a tactic. Keeping in contact with my mates is easier in this age of emails. But I still write letters to many of my old team-mates, people like Tom Graveney and Bob Appleyard. I also stay in contact with many people I have coached. The happiest tour was '54-'55. When you have characters involved like Bill Edrich and Denis Compton, it is impossible not to have fun. They were always there to liven things up. We were a team of egalitarians. I'd walked downstairs at our hotel in Glenelg and realising I'd forgotten a handkerchief called back up the stairs to no one in particular: "Can you pick up a hanky on the way through?" A minute later Denny, our senior pro, trotted down. "Here you go Frank," he said. We shared such a great sense of fraternity. I don't always remember a performance but rarely I forget a face. That's one of the great joys of cricket and cricketers, the wonderful people you meet and get to know. It was in Adelaide that Len said, "The boogers have done us", after Keith Miller grabbed three quick wickets and held a diving catch to have us in all sorts in our second innings. "Hang on a minute," said Denny. "I haven't batted yet", and out he went and soon had helped us win the game - and the Ashes. It was the first time we'd won down under since Bodyline. Northants used to play only one fast bowler, me, and I'd have the opening few overs before the slowies came on, and we had three in George Tribe, Jack Manning and Mickey Allen. What's more, they all bowled left-arm. The wickets were turners and not at all conducive to fast bowling. I'd get all my work away from home. Being knocked out in the middle of an Ashes Test match is not my most pleasant memory. It was an overcast day and Ray Lindwall bowled one from so wide out, his arm wasn't behind the sightscreen. I never saw it. At the last moment, sensing it was short, I turned my back and it struck me right on the back of the neck. No helmets back then. Keith Miller thought Ray had killed me. Seeing me out of it, I'm told that he said: "Jackson [his nickname for Lindwall], I think we've made a mistake." Another in the Leagues who would have walked into Test cricket was the Australian Cec Pepper. Cec had the gifts of a Shane Warne and was a legend in the Leagues. He wasn't particularly athletic but he was so good at what he could do. He could turn the course of a game in ten minutes with either bat or ball. I played six balls in a row from him and missed every one of them. The umpire called "Over", and mightily relieved, I looked up and there was Cec down at my end. "You can open your eyes up now, son," he said. "I've finished!" Cec eventually bowled me with a googly - I'd never seen one before - but I got him back. I bowled him first ball while he was still lifting his bat. So we were even! "Ray Lindwall bowled one from so wide out, his arm wasn't behind the sightscreen. I never saw it. At the last moment, sensing it was short, I turned my back and it struck me right on the back of the neck. Keith Miller thought Ray had killed me"
There are so many overseas players now in the English system. It's very hard to identify the teams, as the players are not tied to a club as they were. I find it almost impossible to follow. At Northampton we were allowed two overseas players and there was no chopping and changing. Everyone knew where they stood. I wonder if the supporter groups, once so integral to the lifeblood of the county clubs, find it as frustrating as me. Was I fired up? Yes. Was I angry? Yes. In those days there was a fast bowler's code. I was about to board the boat train in 1961, heading to Australia, when one of the pressmen stopped me and asked: "Are you leaving England because you are disillusioned with English cricket?" "No," I said. "I've been offered a better job." Carey Baptist Grammar had offered me twice the salary I was earning teaching in Northants. I taught French and history and also coached their first XI. I get around with a stick these days. My body, particularly one of my ankles, isn't as good as it used to be. Totally cricket-related. We didn't have the same mateship in 1958-59 as there had been on previous tours. Freddie Brown was a very autocratic person. It was sad, really. When we went to New Zealand at the end of the Australian leg of the tour, there was just 12 of us to pick from. Four or five had gone home. I got strong from chopping willow trees on Percy Surridge's farm at Horley, just out of London. You had to have lived in the county for whom you were intending to play for a period of two years. During the vacation from university I'd base myself in Northampton and go to Alf Gover's indoor school at Wandsworth on Saturdays and Sundays and do more hard yakka at Percy's during the week. If you are going to bowl quick, you want your optimum effort for a short period of time. It still seems like yesterday, walking off the MCG with my arm draped around George [Statham] at the end of that exhilarating Melbourne morning. Len brought out the champagne and George immediately complained. "Sodie pop," he called it. "Give me a beer," he said. I was four years older and yards slower in 1958-59, probably around Trevor Bailey's pace. I'd played every Test in '54-'55, but in '58-'59 I didn't get a game until the Ashes had been decided. Graham Yallop was the best schoolboy cricketer I coached. He didn't seem to always be fairly treated within the team. His 268 in a Test in Melbourne [in 1983-84] deserved more recognition. Yet he was to be picked only twice more after that. Very strange. English cricket has produced thousands capable of plugging away all day, but the very fastest bowlers must be used in short, sharp bursts so they can back up for a second and third spell. 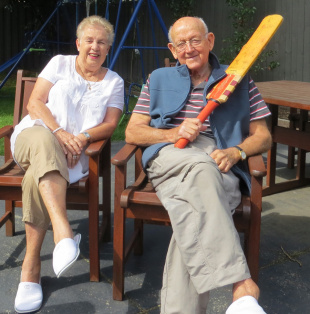 In 1954-55 I had five overs maximum. That's just 40 balls. In Melbourne in a real heatwave in 1958-59, the spells were just one over each. Ursula and I have three children and nine grandchildren so far. Did I bowl too short? No, but I did want to stop the batsmen from getting on to the front foot. I didn't mind them playing back. Alf knew what I was capable of and knew I could bowl fast off just a short run, which was mandatory at his school as the run-ups were restricted. He was the one who suggested I should cut back my run after it had got out of control. I did after Brisbane in 1954-55, and it set me up for the Tests of my life. Of the current English fast bowlers I like watching Jimmy Anderson the most. He's Lancastrian, of course, but he is certainly the most professional and really works the batsmen over. Steven Finn is a work in progress. It's a bit early for him just yet. Stuart Broad has had his moments and puts a high price on his wicket. Once to Jimmy Burke in Melbourne in 1958-59, I bowled a bouncer, and extending my follow-through just a tad, said: "Missed ya!" As I was working back, the non-striker, Colin McDonald, said a quiet "Well bowled, Frank!" Colin was a master of psychology. I played club cricket, or district cricket as they called it in Melbourne back then, with two clubs: Footscray and Melbourne University. But it was only a couple of dozen games spread over four or five years because of my Saturday commitments at Carey. I never did make a first-class hundred but I did get 80-odd for Northants against Yorkshire at Bradford one day and during the 1956-57 tour, in Johannesburg, I batted a fair time when it mattered. I wrote 20 books on cricket. It took a lot of discipline and a lot of late nights, given many were written while I was also working full time. My coaching textbook for Cricket Victoria was reprinted many times. I spent 15 very happy years there, helping to implement a framework for coaches in all major areas throughout the state. That's satisfying.